Dial Archive | Dial | Wintry Wonderland of Mjc | One Lucky Guitar, Inc. The last few months we’ve been really busy here at OLG, working very closely with Matilda Jane Clothing on a range of different projects. From day-to-day customer communications, to planning and branding for the launch of a new Spring Collection, it’s been a great chance to get creative with a brand we understand well. Some of the items shown here go back to late 2013. As holiday sales ramped up, so did the need to keep every order special. Customers have come to enjoy the random little extras that can come with newly purchased clothes. 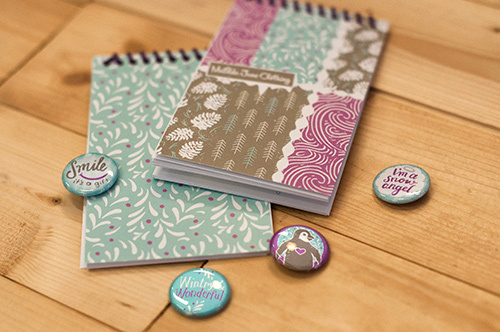 For this purpose, we created a winter-themed notepad along with matching 1-inch buttons and stickers that could make their way into the packages. It is common for the MJC brand to showcase current fabric swatches in the design, and here we took it a step further by illustrating our own weather-related patterns. These patterns lived on through other winter promotions too. Another “extra” sent closer to Christmas was a sheet of custom, MJC “to-and-from” gift tag stickers. 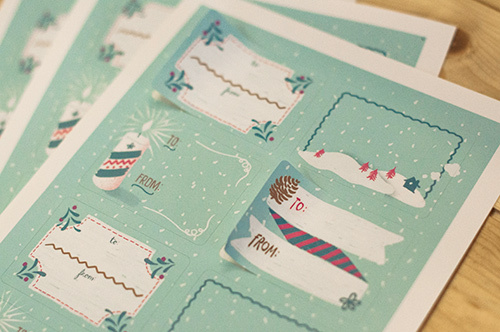 Along with these fun extras, we were asked to create a holiday card that was to be sent specifically to Matilda Jane’s Trunk Keepers—the sales network of people that are the backbone of the company. 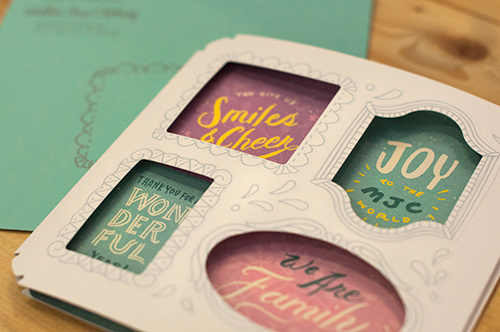 For this, we were able to develop a custom die-cut shape (along with embossing) that worked as illustrated frames. I think it turned out quite nice!